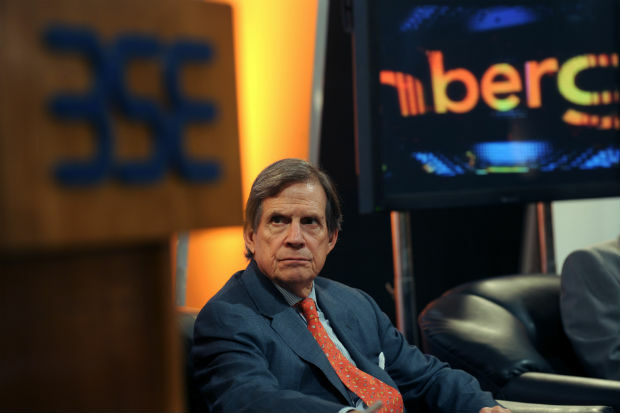 Bloomberg Global Chairman Peter Grauer attends an event at the Bombay Stock Exchange in Mumbai, October 22, 2009. I think it's all a part of a long-time struggle in newsrooms in China the United States and other countries, about whether the financial bottom line should outweigh journalistic values. As a journalist, I am all for good journalism. But, unfortunately, newsmen are often not the ones calling shots these days. Yes, it's a compromise of journalistic values that no journalist wishes to accept or see. Ultimately, that's not why we're in journalism. For example, a few years ago we saw that a Los Angeles Times editor quit in protest after editorial layoffs he believed would compromise the quality of the newspaper’s journalism. Columbia the University President Lee Bollinger, a First Amendment lawyer by profession, suggested years ago that an endowment for news organizations be established—like those that support universities—so that the freedom of the press might be better protected. I can't remember how many newspapers in the U.S. have closed over the years. So, I think that's a brilliant idea to rid journalists of unnecessary interference from the business side. I don't think there is an ideal place for journalists anywhere. And the challenge in China is obvious. A lot of people are fighting, some become a hero or a martyr overnight, others fight for the long haul. If Bloomberg is really going to avoid politically sensitive stories in China going forward, as press reports are suggesting, they will be doing China a great disservice. The Chinese government has got to realize that a more professional, more open press will lead to more stability, not less. Surely Xi Jinping knows that the media can help check corruption precisely at a time when he has made it clear he wants to put an end to that scourge, which arguably is the greatest threat to China’s stability. Honest, investigative reports can also provide an escape valve—a channel for airing of the frustrations that have been building over the cruel, dirty dealings of officials, sharpening income disparities, and fears about environmental disaster. I was one of the jurors who chose Bloomberg’s investigative stories on the wealth of Chinese leaders as the winner of the Asia Society’s Oz Elliott Prize for Journalism last year. How sad, if the reports are true, to think that Bloomberg is now throwing journalistic integrity out the window for the sake of profits. Where will it draw the line? What if there is a negative China business development that might affect the markets—will Bloomberg pull its reporters off that one, too? And for that matter, will Bloomberg stop doing tough reporting on companies that buy its terminals? Where does it stop? A kowtowing Bloomberg would just play into the hands of less enlightened propaganda tsars who don’t understand that more discussion leads to more stability. China’s more farsighted leaders know that a modernizing China inevitably will become more open. I should think Bloomberg would want to be on the right side of history. The Chairman “rethinks,” a journalist departs with a bang, and Bloomberg, which had led the way in authoritative investigative reports on the government/business nexus in China becomes instead the poster child for the ills of the business/pressure nexus in journalism. Does this mean that it is impossible to do good journalism in China? Of course not. In some ways, this is a golden age for foreign reporting in the People’s Republic. Key wire services, newspapers and magazines have more and better trained reporters in China than ever before, travel is freer, sources are more available and the amount of sheer official data, information and verbiage that is turned out is unrivaled—and almost impossible to keep up with. The trick is turning all this raw input into journalism of the highest order. Bloomberg and The New York Times showed that weaving publicly available information with source material can yield treasures, but also bring China’s wrath and financial penalties. That’s a big risk to take, but it is one worth taking and also possible to take, if you have courage and prepare the ground properly. First, you have to be clear about what you are and what you stand for, and not let any opportunity go by without repeating it. Just as China repeats its “principled stands” on Taiwan, Tibet, human rights, etc., in word-perfect order year after year, so too I, when I worked for Reuters, would use that company’s Trust Principles and fundamental journalistic values as the introduction to any official meeting. If your principles are strong and steadfast, they become something that has to be dealt with. If your principles can be rethought and changed, they become simply a negotiating point. Second, you must make sure you have plenty of opportunities to talk about your principles! Government relations is not something that is just for crisis times, it must be a key job for bureau chiefs, editors and senior company officials year in and year out. Your reporting focuses should never be a surprise. Your standards should be the stuff of regular conversations. Third, you have to be good. We know Bloomberg’s first stories were good—we read them. The story that has caused the current uproar has not been published so quite honestly none of us can really judge. We have excellent reporters and editors saying it was ready to go, we have the editor-in-chief, himself an excellent journalist, saying it wasn’t. Is this the reporter vs. editor tension that every organization has—and which is actually what you need for quality—or is it something nefarious? We really can’t and shouldn’t say. What we can say is that if you want to do tough reporting on China, your stories had better be bullet proof, because the bullets will come. Fourth, you have to be ready for all your preparatory work to be for naught and for China to sanction you. China has expelled reporters in the past, it can and has caused monumental and even insurmountable bureaucratic headaches for others, it has caused economic harm by restricting sales and blocking websites. But China, with its 5,000 years of history, is excellent at playing the long game, and if you want to be in China that is the game you must play. Ignore quarterly results. Ignore annual profit. Concentrate on the long term effects on your reputation and standing, and on the eventual need for China to be more open. Fifth, you need to get your stakeholders involved. You should be writing the tough stories because your readers need them. The banks and brokerages who subscribe to Bloomberg should be demanding more of the investigative reports because they help them make decisions. The exchanges who list Chinese IPOs should be demanding more of the reports because they bring needed transparency to the market. And if your readers aren’t demanding the stories, you’re either writing them wrong or you’re not working with your readers closely enough. Sixth, you must be fair and acknowledge that China’s reflexive paranoia that foreign reporting on China is out to “get” the People’s Republic can sometimes be stimulated by the stories themselves. If you go after the intricate relationship between business and government in China without going after the intricate relationship between business and government in the United States with the same fervor, you are doing no one any favors. If you write China stories loaded with snark and without empathy for China’s point of view, you merely play into perpetuating an unhealthy antagonism instead of the healthy skepticism and drive for the truth that good journalism must be. Well, I see two crucial aspects to the question of where journalism in China (and on China) goes from here. First, there is the health and long-term development of Chinese news media. Second, there is foreign news coverage of China. In the past, these were two mostly distinct spheres, and the Party leadership felt it could treat them as such. The Party's priority was ensuring social and political stability at home by controlling, or "guiding," domestic public opinion -- which meant keeping a choke-hold on Chinese news media. Foreign news coverage was mostly a nettlesome question of China's image overseas, and after 2007 of its "soft power." In fact, most of the truly probing coverage was being done against immense odds by the Chinese media -- counter-intuitive for some, but true. Enabled by the explosive growth of social media in China, including platforms like Sina Weibo, The New York Times and Bloomberg stories shattered the wall between these two spheres. I remember watching David Barboza's story spreading like wildfire on Sina Weibo. Facts, images, translations. It became a domestic news story, shedding unwelcome light on the business associations of one of the country's most loved and respected political leaders. Now we've seen quite clearly China's response to this shift. The authorities are trying to stop future coverage of this kind by poisoning the roots—denying visas to veteran reporters like Chris Buckley, and forcing Bloomberg to make a disgusting choice between strong journalism and a core business for which China is a major market. Another issue here is a revolution in available data and information for journalists about China, and a growing number of China lifers (as opposed to parachute journalists) who are able to parse that information and reveal its significance. I think we'll continue to see great reporting on China, but the costs of that reporting will have to be shared in new and innovative ways. I think the recent work of the International Consortium of Investigative Journalists is just one example. Facing similar conflicts between editorial values and business interests, the two leading American media companies made completely different choices. In public discussions, Bloomberg has become a villain, smearing the cherished values of the free press and independent journalism, while The New York Times is held up as a shining light of objectivity. Why? Free press and independent journalism are something no media dares to say “no” to. But the cost of upholding these values is different for each player in every instance. The values may mean everything to some media but, to others, aren’t worth sacrificing everything else for. Publishing a “sensitive” article may mean losing a work visa for a foreign reporter, but it could mean imprisonment for a Chinese reporter. Being disobedient may cause one journalist to lose the magazine she built over ten years. Others using “self-media” can get shut down one day only to start over again a few months later. It’s pointless to discuss whether or not we should boo Bloomberg. Instead, we should consider the following two points: First, “media” has already become as broad a concept as “dog”—Chihuahua to mastiff. Neglecting the differences between breeds is too simplistic. Second, moral constraint or professional conscience sometimes is weak and unreliable. Something else is reshaping and will redefine the concept of media. Stronger business concerns can force media to kowtow to power, but new technology may unintentionally reduce the cost of pursuing and upholding the values of journalistic independence. Since the Qing Dynasty, foreign journalists in China have been a mix of carpetbaggers, phoneys, amateurs, businessmen, self-promoters, fantasists and cowards as well a few people and organizations who make a genuine effort to tell stories that matter. Bloomberg and every other foreign media company with a presence in China will, by their actions in the coming years, make clear which type of journalistic enterprise they are. Growing economic power makes the Chinese Communist Party’s political control more arrogant. Some Western companies’ compromise for business interests not only undermines the image of Western countries, but also undoubtedly gives the C.C.P. more excuses to say "no" to political transformation. These Western companies will have to face more and more demands and limits from the CCP. In fact, this has already happened and is becoming more and more apparent. No one is able to succeed at the free press while abandoning their professional principles. Some media in Taiwan and Hong Kong once held on to this kind of fantasy, but all failed. Mr. Murdoch also tried it over the last two decades. Even though his then China-born wife did everything in her power to flirt with C.C.P. leaders, the couple ended up throwing good money after bad. The Financial Times, The Wall Street Journal and The New York Times each set up their Chinese editions. But in order to survive in China the FT and the WSJ chose not to translate content that might cause discomfort to the CCP—the very content best representing their professional principles. All three newspapers’ Chinese versions have limited earnings, and their potential market is small, but at least The New York Times has maintained its dignity. It is fine for Bloomberg to surrender its principles to gain access to the China market if it simply identifies itself as a digital communication tool. But it is shameful to abandon its professional morals if it still wants people to regard it as a part of the professional free press with a basic sense of social responsibility. As a journalist pushing forward Chinese journalism, the only thing I can say to Bloomberg is that it’s fine to choose not to be a hero, but you don’t have to be an accomplice. I appreciated Ouyang Bin's thoughts about the complications and compromises for media companies that make profits in other areas. In the "old days," U.S. Media ownership (then mostly local newspapers and local radio and TV outlets where owners had very lucrative virtual monopolies) was largely limited to wealthy local families who did not, for the most part, dabble in other businesses. These days, there is much more centralized corporate ownership locally and, of course, nationally: Warren Buffet's huge Berkshire Hathaway now owns more than 50 local newspapers, in addition to a raft of other businesses whose affairs may (or may not) be covered by his company's papers across the nation. This is a great, wide-ranging discussion. David Bandurski rightly points to the new possibilities for solid news coverage from smaller Web operations, though this will take time and resources if they wish to take on big subjects, companies and countries, with any regularity, and I applaud Dinda Elliot's straight take on Bloomberg's very deeply compromised position in China. As for my friend Chen Weihua, well, I don't think public endowments or, for that matter, private foundation grants are necessarily the best way to save dying newspapers. If the technology is obsolete or even shows signs of approaching obsolescence—take for instance the carriage industry in the late 18th Century—some disruptor, say Mr. Henry Ford, will come along with the Next New Thing, an automobile. Mr. Ford made his millions, and justly so, for he had a great idea. Today, there is a Ford Foundation (and even a Knight Foundation, named after another foresighted entrepreneur, John S. Knight, the publisher of the Akron Beacon Journal and, eventually, three-score other daily newspapers). But neither Ford nor Knight can save obsolete newspapers. Only an intense concentration in developing and redeveloping both honest, useful reporting and cutting edge technology can create the big media brands of the future. Some of those brands may be names we know already; others will be the new names we will need to know. Alas, Bloomberg may not be one of them.